Daredevil has weathered the comic book industry storms and sunny days for the last 40 some odd years. His personality and persona have taken some unique twists over those years. He and his mortal half, Matt Murdock, belong in the Marvel Comics camp of superheroes. Created by Stan Lee and Bill Everett in April 1964, he debuted in Daredevil #1. As a child, Matthew Murdock was blinded when an act of heroism put him in the path of radioactive materials. Though no longer able to see, the accident heightened his remaining senses to superhuman levels and endowed in him a sixth, sonar-like sense. In his mortal life, Murdock is a high-profile attorney. When Matt is off the lawyer intense time clock, he uses his abilities as well as his training in acrobatics and martial arts to protect the people of Hell's Kitchen as the pulp hero Dare-devil. Dare-devil was not an overly popular or influential Marvel hero until the late 1970s, when writer/illustrator Frank Miller made him a much darker character. Miller's Daredevil was a fierce guardian of inner city New York who danced along the edge of sanity as he attempted to uproot deep corruption and urban decay. The character has enjoyed a modern renaissance since the launch of the Marvel Knights imprint, with notable creators Kevin Smith, Brian Michael Bendis and Alex Maleev. Matt Murdock grew up in the Hell's Kitchen neighborhood of New York City. His father, Battling Jack Murdock, was a fading boxer and a single father, who occasionally had to hire out as an enforcer for local crime types. Desperate to have Matt lead a better life than his own, Jack insisted his son stay out of trouble and pursue an education. Though endlessly taunted with the sarcastic nickname "Daredevil" by school bullies, Matt endured his hardships and studied hard, working out in secret as a way to vent his anger. An act of heroism, however, would change his life completely. As an elderly blind man was crossing the street one day, Matt keenly observed an oncoming truck out of control and heading straight for the man. As it turns out, this truck happened to be hauling radioactive waste. Matt selflessly pulled the man to safety. But, in doing so, was struck in the face with radioactive material from a damaged storage drum. A difficult recovery ensued. As Matt learned to cope with his blind disability, he discovered the benefits of his radioactive exposure. Namely, his remaining senses had been raised to superhuman sharpness. He could hear any sound regardless of volume or pitch. His sense of smell was more capable than a bloodhound. His sense of taste could identify individual ingredients of prepared foods. And his touch was so sensitive that he could read regular newsprint as if it were Braille. These improvements also granted him a radar type sense, which would allow him to detect the positions and general shape of objects around him. Matt (Daredevil) made good on his promise to his father, and excelled in his law school studies. However his father continued to struggle as a now, unsuccessful boxer. This plight led Jack Murdock to approach the only fight promoter willing to book him, a small time crook nicknamed the Fixer. “Battling Jack” found a late-life renaissance as the Fixer engineered a series of rigged matches. This resulted in the once near-destitute boxer becoming a title contender. On the night of the biggest fight of his life, the Fixer looked to cash in on his investment and instructed Jack to take a dive. Seeing Matt in the crowd he could not disappoint his son. Battling Jack Murdock gave the fight of his life to win by knockout and subsequently gave his life when the Fixer ordered his hit. Devastated, both by the loss of his father and the judicial systems failure to convict the Fixer, Matt Murdock took it upon himself to provide justice. Remembering the promise he made to his father not to lead a violent life, Matt created a new identity for himself. He then fashioned a yellow and black costume from his father's boxing robes. 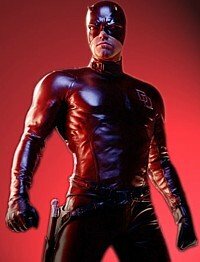 Adopting his childhood moniker, he declared the name "Daredevil", as his injustice fighting identity. As Daredevil he confronted the Fixer's gang, making short work of the lot through the use of his hidden abilities and secret training. The Fixer himself managed to escape to a subway tunnel wherein his own panic and fear of Daredevil produced in him a fatal heart attack. Together with secretary, Karen Page and best pal and partner Franklin "Foggy" Nelson, Murdock became the lawyer he promised his dad he would become. But realizing that the justice system was imperfect, and that he could better serve society and his own personal torment with a dual career in costumed crime fighting, Matt Murdock permanently adopted the mantle of Daredevil. Several highly talented writers and artists have brought the evolution of Daredevil to his present state. The next page in this general synopsis will comment on Frank Miller, Kevin Smith, etc who were instrumental in further development. Click on over and find out. Now if you happen to be into collecting and reading more, I have researched some excellent resources. Here is a collection of Daredevil comics and back issues . I don’t think you will be disappointed. You may very well find a tidbit or two worthy of your interest. And of course, the ole standby, Amazon has a few items to tickle your taste buds. Just click the image at the left. Don’t stay too long though, and come back here. If you want to keep up on the varied and interesting activities going on in the world of comic books, then feel free to sign up for my newsletter “Comics Galore” in the form below. And by all means, I would love to hear your comments and opinions on the transformations the Daredevil character has gone through. You can sure leave them for me at my contact page in the menu at the left. I may even be able to include them in my newsletter. I thank you ahead of time.